The quickest and easiest of all salads, this tomato and feta combination takes a few minutes, tastes wonderful, and adds an authentic Greek touch to any meal. 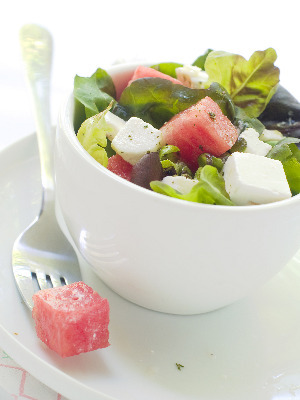 If you don’t have time or the ingredients for a full Greek salad, this is a great substitute. Wash and core the tomato, and cut into bite-sized chunks. 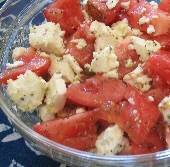 Put the feta on top, sprinkle with pepper and dried oregano. Pour olive oil over the top – more if you like to dip bread, less if not – and serve. Note: If the tomato skin is tough, peel the tomato before making the salad. Photo at right is of a salad prepared by my granddaughter. She managed everything except the crumbling, so the feta was cut into chunks. It didn’t change the taste at all!